This free event is open to all, and attendees from throughout California’s fire-ravaged communities are warmly welcomed! 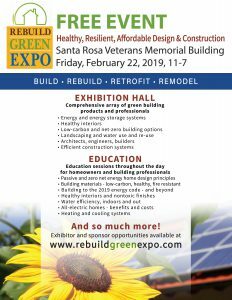 The Expo’s goal is to provide information that will help fire survivors rebuild their homes and communities to be as resilient, sustainable, and healthy as possible — and as affordably as possible. Please share with all Northern California networks.